This is a fine 1835 map of Brazil, Bolivia and Peru by the important American mapmaker T. G. Bradford. It covers all of modern day Brazil from Guyana and Colombia in the north to Uruguay in the south and from Bolivia in the west to the Atlantic. Bolivia's claims to the Atacama Desert and Peru's claims to the Tarapaca region - both of which are today part of Chile, are shown here. Towns, rivers, mountains, lakes and other topographical features are noted. Elevation is rendered by hachure and political and regional territories are color coded. 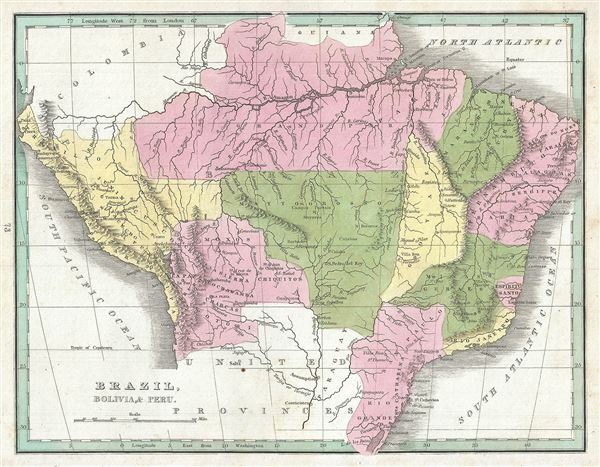 This map was issued shortly after the Brazilian war of Independence that freed the massive South America nation from colonial Portuguese control in 1822. In 1831, Pedro I, the founder and first ruler of the new Empire of Brazil abdicated in favor of his five year old son and left for Europe. Under the weak regency elected to rule the country until Pedro II came of age as Emperor, Brazil descended into in civil war. In 1840, Pedro II was declared fit to rule and, proving a strong monarch, managed to bring stability and peace to Brazil. Meanwhile in Peru and Bolivia, shortly after this map was prepared, the Peru-Bolivian Confederation came into existence. The Confederation proved ephemeral, collapsing in 1839 following the War of the Confederation, a conflict between Chile, Peruvian rebels, and Argentina against the Peru-Bolivian Confederation. This map was published as plate no. 73 in Thomas G. Bradford's 1835 Comprehensive Atlas Geographical, Historical and Commercial. Bradford's atlas, published in 1835 was an important work on many levels. First, it was one of the first American atlases to follow an encyclopedic format, offering readers extensive geographical and statistical tables to supplement the maps themselves. Second, it was published in Boston and influenced the city's rise as a publishing center later in the 19th century (at the time most publishing in the United States was restricted to New York and Philadelphia). Third, this atlas was the first to contain a separate and specific map showing the Republic of Texas. Fourth and finally, Bradford's atlas in some instances broke the Euro-centric mold regarding atlas production. Among other things, Bradford focused his atlas on the Americas and abandoned the classical decoration common in European atlases in favor of a more informational and inherently American approach.